street view of Forsyth-Walton building. 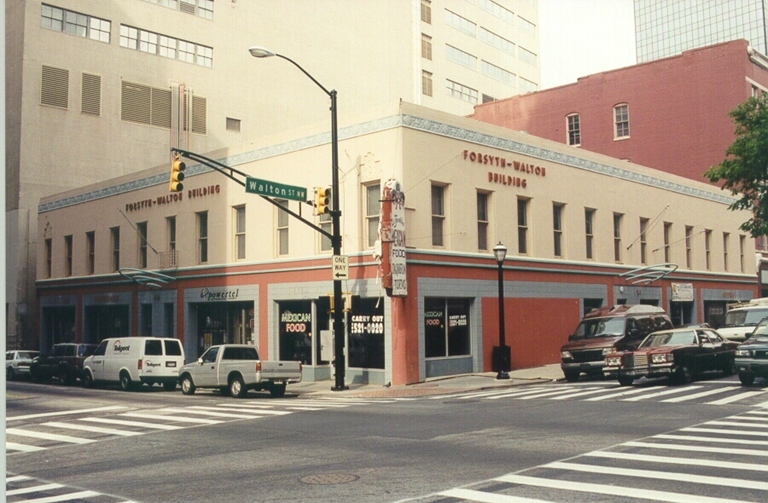 Located within the Fairlie-Poplar district, the Forsyth-Walton building stands as one of the few example of the early downtown commercial area left. Built in 1900, the structure has served the area over the last 115 years primarily as retail space. The Art Deco facade may have been added as early as 1936, becoming a part of the buildings historic character. The Forsyth-Walton building is under threat from commercial encroachment, as a near-by telecommunication company would like to raze the building in order to expand for more server storage. The Atlanta Preservation center continues to advocate for this structure as its loss would adversely affect the historic character of the surrounding district and would eliminate one of the few remaining building from Atlanta's commercial beginnings still extant.